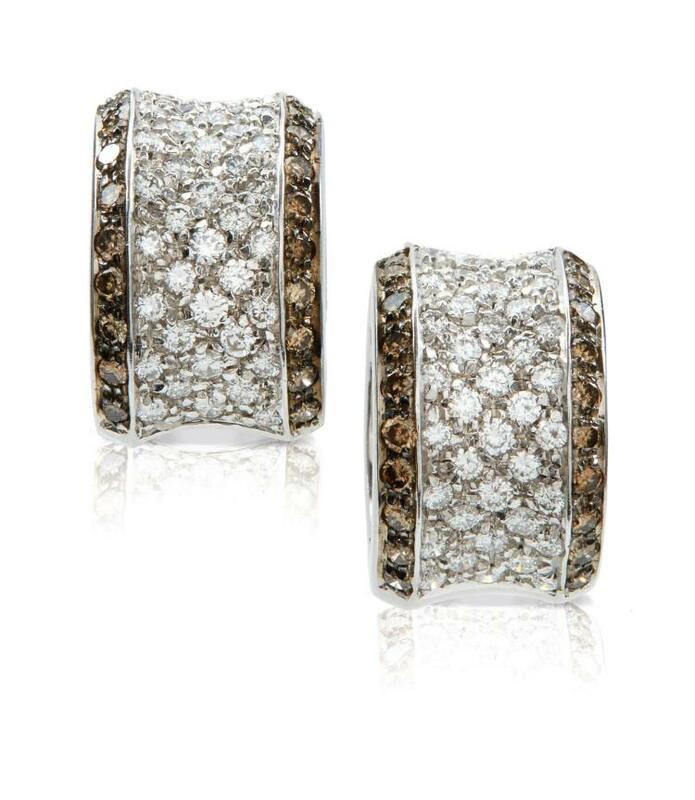 Description: Each of hoop design, the front pavé-set with brilliant-cut near colourless and brown diamonds, post and clip fittings, Italian maker's marks. Please note that the diamonds of brown tint have not been tested for natural origin. Condition: Inside of each clip stamped with 750 for 18 carat gold and Italian maker's mark 520 AL and 'nt'. Diamonds bright and lively, estimated total diamond weight approximately 2.00-2.40 carats. Clips close securely. Total gross weight approximately 15.3 grams, width approximately 10mm. In good condition. Please note Condition 11 of the Conditions of Business for Buyers (Online Only) is not applicable to this lot. For further information please contact the department on +44 (0)207 293 6409.